In this video we will discuss sequence object in SQL Server. DataType Built-in integer type (tinyint , smallint, int, bigint, decimal etc...) or user-defined integer type. Default bigint. INCREMENT BY The value to increment or decrement by. The value will be decremented if a negative value is specified. CYCLE Specifies whether the sequence object should restart when the max value (for incrementing sequence object) or min value (for decrementing sequence object) is reached. Default is NO CYCLE, which throws an error when minimum or maximum value is exceeded. CACHE Cache sequence values for performance. Default value is CACHE. Every time you execute the above query the sequence value will be incremented by 1. I executed the above query 5 times, so the current sequence value is 5. Specifying MIN and MAX values for the sequence : Use the MINVALUE and MAXVALUE arguments to specify the MIN and MAX values respectively. Step 2 : Retrieve the next sequence value. The sequence value starts at 100. Every time we call NEXT VALUE, the value will be incremented by 10. The sequence object 'SequenceObject' has reached its minimum or maximum value. 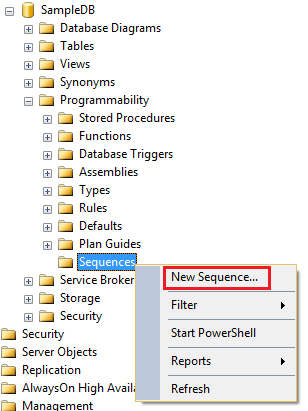 Restart the sequence object to allow new values to be generated. At this point, whe the sequence object has reached it's maximum value, and if you ask for the NEXT VALUE, sequence object starts from the minimum value again which in this case is 100. To improve performance, the Sequence object values can be cached using the CACHE option. When the values are cached they are read from the memory instead of from the disk, which improves the performance. When the cache option is specified you can also specify the size of th cache , that is the number of values to cache. The following example, creates the sequence object with 10 values cached. When the 11th value is requested, the next 10 values will be cached again. Please provide us a video on Fill Factor with explanation. Hi ,Venkat hope you are doing well....Sir you have discssed all the major topic and concept of .net but one thing which you forgot to discuss is that how to make forum to disscuss on any website for question and ansewer like as you have implemented in your website where i am commenting please discuss it as well as soon as you can.